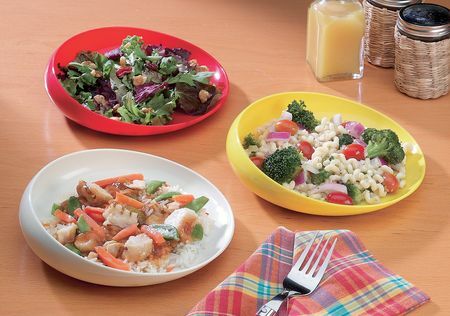 Available in attractive yellow, red, or traditional ivory, this unbreakable non-slip dish is an ideal disability aid. High in the back but moulded low in front, the round scoop dish has a non-slip, rubber padded bottom that provides control when eating with one hand. The extra stability provided by this quality item will almost certainly assist in developing user confidence. Can be washed in the top shelf of the dishwasher - but not recommended for microwave use.